Microblading by definition, is the implantation of pigment in the skin. Generally, this treatment is most recommended for those who have flaws in the eyebrow region. With microblading, it's possible to draw eyebrows, and correct flaws using features of color and thickness in a process very similar to that of permanent makeup. By applying one stroke at a time, it will increase the impression of the natural look of an eyebrow. There are two types of microblading: aesthetic and medical. The two have the same end, but what sets them apart are the reasons why the process should be done. Aesthetic microblading, as its name says, refers to the process of implantation of pigment in the skin motivated by reasons solely esthetic, always depending on the will of the patient and the authorization of a properly trained professional. Medical microblading usually occurs as a result of a medical indication to correct flaws in the eyebrows, such as burns, flaccidity, and other problems. Microblading can be both aesthetic and medical, always depending on the reasons that led the patient to perform this process. Are there risks associated with microblading, and who is able to go through with the procedure? All persons who need or opt for microblading are able to perform this procedure. There is no evidence of allergic reactions to microblading and no tests that indicate any signs of health issues after this procedure. People with anemia or use a pacemaker however, are not recommended to perform this procedure. It is important to note that even oily skin and more sensitive skin can also go through the process of microblading. It is always important to note that prior to your first session, there is a standard consent form, that needs to be filled out. First, the practitioner consults with the patient about what they would like to improve with their eyebrow/s. After a thorough exam, the microblader will create a personalized diagram and draw the new eyebrow/s to provide a representation of the new eyebrow/s which can be adjusted if need be. If approved by the patient, the professional will apply a topical anesthesia and begin the pigment implantation according to the outline of the drawing. The whole process usually lasts an hour and a half on average for one session. However, the application of the topical anesthesia takes about half an hour for it to fully numb the area. Often more than one microblading session is needed for small touch-ups which can last up to an hour. Yes retouching is necessary, the procedure usually does not achieve perfect results in a single session. The retouching makes the eyebrows look more exuberant, and have to be done 4-6 weeks after the intitial microblading session. Extra touch-ups after the second visit are rarely needed. 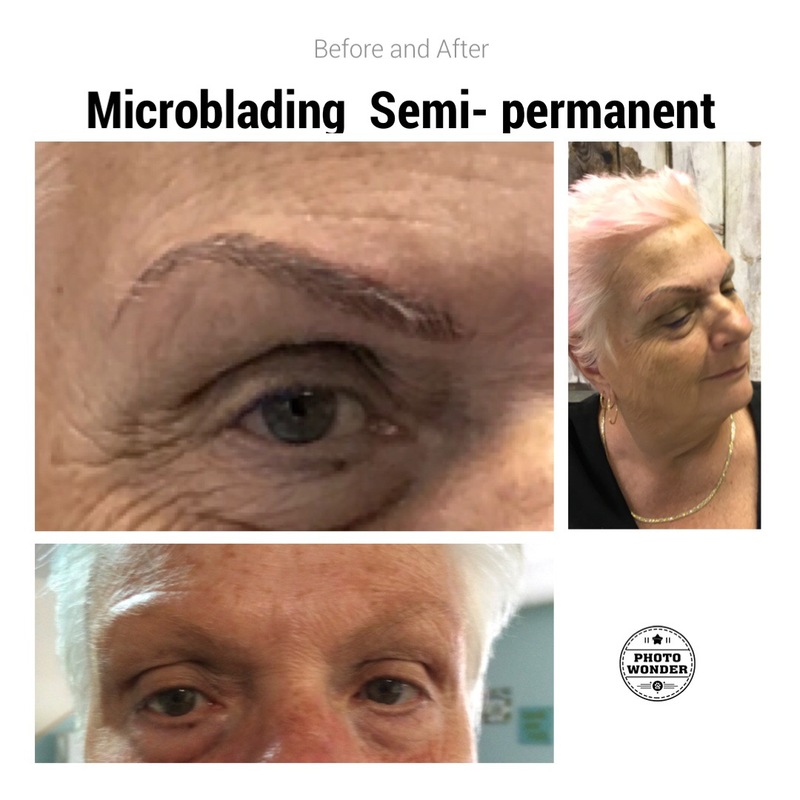 In microblading, your practitioner will use an apparatus called a dermograph (widely used for sensitive and delicate work) to apply the pigment with the micro-blade manufactured only for this purpose. This device has revolutionized the microblading process to leave no scars and make the end result more natural. Previously microblading was a more aggressive treatment and left permanent marks on the skin. Who will be the one behind the blade? Only properly trained professionals are able to do the microblading, who are trained as designers of eyebrows and specialists in micropigmentation. There are not many rules to follow except NO alcohol or any blood thinning medication before micropigmentation. Little care is required after the procedure. However, it's recommended that the patient cleans the brows for the first two days with the prescibed solution and makes use of the healing product that will also be given out (courtesy of Brazilian Silhouette) for a minimum of two weeks. The patient can expect immediate results. Usually, the pigmentation color used in the procedure clears after four days, and will fade so don't stress out. Microblading is usually an aesthetic treatment with no margin of error as long as it's done correctly. Just remember microblading is supposed to look natural and all eyebrows are sisters not twins.